The Coalition to Save Manned Space Exploration: YOU Can Commemorate 50 Years of Human Spaceflight--By Helping Launch a New Space Program! YOU Can Commemorate 50 Years of Human Spaceflight--By Helping Launch a New Space Program! Two historic anniversaries occur in May. 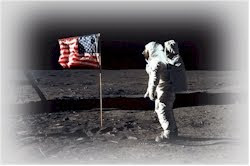 May 5th, 1961 was the day Alan Shepard became the first American in space, and May 25, 1961, the day President Kennedy launched the nation to land on the Moon "in this decade." Lets not wait decades to next send Americans beyond Earth orbit. We can return to the Moon and establish a permanent base there to test components for Mars in this decade. We can go to an asteroid in this decade. And perhaps by 2025 we can launch the mission to Mars which will open a wonderful chapter in human history as we land on Mars! Remember it took just six years to build the complete Apollo system--Saturn rockets, capsule, lunar lander, launch pad, computers, spacesuits, rovers--everything! Now, after fifty years of experience in space and great advances in technology, the idea we must wait decades is ridiculous! Between now and May 25, let's all spread the word to call Congress and the White House in support of a new "in this decade" plan to return to the Moon and visit an asteroid in this decade; and to land on Mars as soon afterwards as possible, perhaps by 2025. Space is a national priority and Congress and the White House must offer sufficient support, or we effectively cede leadership in high technology to those nations willing to take bold actions. They, not us will reap the rewards of high tech leadership, jobs and investments. They, not us will reap the rewards from new technologies developed as they reach new worlds without us. That's our future if we sit this out and accept a second-class status in the world. So lets go bold and make this a big campaign which will help make history. Call Congress at 202-224-3121, the White House is 202-456-1111. Tweet it, Facebook it, email it; let's make this huge! Let's launch a new space program now!